Shake a Leg is a fictional text that brings together a cultural celebration of food, dance and storytelling across cultures and generations. Prior to beginning the exploration of Shake a Leg talk about the importance of Acknowledgement of Country. If this is unfamiliar read the advice about constructing an Acknowledgement of Country here before beginning. The information will assist you in constructing an Acknowledgement that is relevant to your context and one that can be shared with your students. The main character is a ‘Murri fella’ who went to Italy where he learned to make pizza. Begin by locating Italy on a map or a globe. Talk about the Murri people from Northern Queensland. Identify and briefly explore this region with your students. Before reading, activate further prior knowledge and build enthusiasm for the text by exposing students to the pre-reading strategy of using an anticipation guide. The anticipation guide can be used as a whole class or in small groups. Before commencing this lesson view an example of the Anticipation Guide. Model the strategy for students and explain your thinking processes as you go. Introduce the book and the strategy to the students and go through each question of the anticipation guide with students allowing them to decide if they agree or disagree with each statement. Once completed, read Shake a Leg to the class pausing to discuss the statements from the anticipation guide as you read. You might like to start with this video showing Boori Monty Pryor reading the beginning of the book. You may also like to follow up by watching a video showing Aboriginal dances. Connecting to class/community backgrounds and cultures. Throughout the text there are references to countries and cultures – Indigenous and migrant. In the classroom create a display based around a map of the world. Using map pins, locate and label the places discussed in the story – Italy, Far North Queensland. Identify where your students originate from (or their parents) and mark these locations on a map. As part of the display include a map of Indigenous Australia and identify the local Indigenous culture for your school area. Discuss with students that throughout the book there are words taken from other cultures. In small groups match words from the story to their origin and meaning. Add these words to the class display. Identify local Indigenous words and add to the display alongside the English word. How can dance communicate ideas? What was the purpose of the dances in the story Shake a Leg? What movements are the dancers making? What is the purpose of each dance? How did you feel watching each dance? Ask students to record their findings on an interactive Venn Diagram. Invite students to give four reasons why different cultures use dance and why dance is important. Begin by explaining to students how the connections we make to texts help us to comprehend what we are reading. View or create anchor charts explaining Text-to-self, Text-to-text and Text-to-world connections. Show students sentence stems and model how to use these sentence starters by reading a section of the book and then making a text connection. Example response: I remember when I visited Far North Queensland, the big wide streets and the warm, humid weather. When I read this part I remember the balmy evenings and imagine how the boys must feel walking down the quiet, outback streets at dusk. I imagine the fruit bats coming out, feeling the warm evening air, … my experience helps me to visualise the setting. In small groups, give each group a piece of chart paper, markers and post-it notes. Ask each group to divide the paper into the following headings. While students listen to another reading of the story, suggest they make notes on post-it notes about the connections they are making to the text. Prior to discussion, number students off in each group (e.g. 1–3). Explain that students will be required to discuss the connections the members of their group made and one member will be called on to share the group’s findings. Using a round robin process within the group students share the connections they made using the sentence stems and placing their sticky notes under the correct heading. After group discussion choose students to share with the class e.g. Number 2’s share a Text-to-self connection your group made. Conclude the discussion by asking students to reflect on the text connections they made that helped them to better understand the story and the characters and the connections that did not add to their understanding of the text. Students roll a dice and respond to the question that corresponds to the number they have rolled. This activity could be undertaken as a small group rotation during guided reading time or by providing multiple copies of the text for the whole class to complete the activity at the same time. One student rolls the dice and then answers the question using the text to support their answer. You can use these examples of Roll and Read Questions (PDF, 92KB) or create your own. Students will develop their understanding of theme and messages presented in stories through discussion. Using this graphic organiser ask students to identify a theme or main idea presented in the picture book. Invite students to share their ideas with the class supporting their ideas with evidence from the text. Once students have an understanding of how to identify the theme of a story, the themes of similar texts could be compared using a Venn Diagram to identify similarities and differences in similar texts. See the More Resources page (link at the bottom of this page) for a list of possible texts. Students will demonstrate their understanding of what they have learnt through a ‘Message in a Bottle’ activity. Tell students that a character in the text wants to share what he or she has learned as a result of his or her experiences through the course of the story. The character has decided to send a message in a bottle or some other appropriate container. Have each student decorate a container with symbols and scenery appropriate to the text and its theme. This could be done by drawing on paper and then taping or gluing the artwork to the bottle. Ask students to write a letter from the chosen character’s point of view. This letter should express the character’s feelings about the life lessons he or she has learned. At the beginning of the letter, ask students to state the theme they think the text conveyed. In the body of the letter, have students incorporate three points that support their ideas. Tell students the bottle they create will be given to a student in another class who will judge if they presented three points that connect to the theme nominated. Remind students to be creative and make sure to write as the character in the text would. Prior to this lesson review any work you have previously done on visual features of texts such as framing, placement, salience, composition, point of view and how choices impact on viewer response. Focus on building a vocabulary to discuss these text features. In the lesson students will begin by discussing some of the features of the graphic novel style in which Shake A Leg is written. As a whole class take students on a picture walk through the book, stopping to discuss and list the visual features of the text such as illustrator’s techniques, speech bubbles, how the narrative is written and anything students notice compared to other picture books they have read. Prompt students to talk about gaze, use of colour, impact of background images and angles and how these features change throughout the text. Model the use of sentence starters such as ‘I see…’, ‘ I think…’ and ‘I wonder…’ to facilitate discussion about the text features and visual layout. Throughout the picture walk pause to allow students to turn to a partner to share their observations and thinking. Encourage them to use visual evidence from the text to support their thinking. Think about the placement of characters on this page. What do you notice? Has the illustrator created the visual in a way that changes your perspective as a reader? Focus on the final double page. How do you respond to this? What techniques has the illustrator used to evoke those feelings? Think about placement of characters, use of colour, etc. After the whole class session, ask students to work in small groups to analyse different sections of the text. Provide each group with chart paper and a copy of the book indicating a double-page spread they will work on. Students set the page up to have three columns. Choose students to share their findings with the class by calling out a number for each group. Mentor texts for similes and metaphors (see book list in More Resources tab below). Prior to commencing this lesson collect picture books and other books at appropriate reading levels that contain examples of similes and metaphors. Examples can be found here. Alternatively set this as a reading task ahead of time for students to read with purpose to locate books with these features. Create an anchor chart explaining the difference between a simile and a metaphor. Click here for an example. At the commencement of the lesson students could view this video to help them to understand the difference between similes and metaphors if there is not a firm knowledge base. In small groups, students conduct a simile and metaphor hunt using Shake A Leg and then other picture books. Students write the similes and metaphors they find on the paper strips and then sort them into two groups under the headings ‘similes’ and ‘metaphors’. Students now create a poster about one of the characters, using their knowledge of similes. Students sketch the chosen character in the middle of a piece of A3 cartridge paper with the title ‘Similes about character X’ and then write similes about the character around the sketch. For example a student might think one of the characters is strong and writes ‘As strong as an ox’. In a unique way this book promotes cultural understanding as it weaves together Italian and Aboriginal cultures using food and dance. The book also suggests that stories are everywhere. Draw students’ attention to the end papers where the serpent ‘links’ the two countries. Recap the story. Ask your students if they were surprised when they discovered the boys hunting for pizza in Far North Queensland and the friendly greeting in Italian they got at the pizza shop. Now ask students to look back through the book and think about what surprised and/or puzzled the boys. Prompt them to look for clues such as text layout and the use of the ellipsis (…). Next ask students to think about all the techniques that are used such as punctuation, speech bubbles, placement of text and images, etc. In the example above the ellipsis is used as well as text placement. Using this information and other learnings so far, invite students to write several sentences about how this text (the combination of visual and print) promotes cultural understanding. The main character and how he relates to the boys. The boys’ reactions and questions and his offer to ‘paint’ the boys and teach them a dance. Invite students to pair-share their responses. Pose a question to the whole class: What does the book say about multicultural Australia? Engage in a general discussion prompting the children to make connections to the text. All you fellas watching, come up, join in, warrima. Clap your hands, little ones. Get down and dance, you smart young things, mummas and daddas. Let’s get the whole town dancing! Ask students to consider the words from the book and write a paragraph as to what these words mean to them. Remind them they can draw on the activities and learning so far and their own experiences. As they write they should also consider the audience (classmates) for the writing. Share and compare in pairs, encouraging the students to give his/her partner a response noting similarities and differences. Then share responses in small groups and conclude with a whole-class discussion. 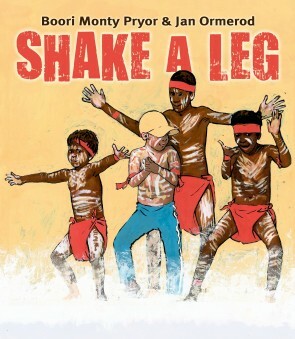 In Shake A Leg, Bertie mentions that ‘Pizza, is much more than flour and water…It’s to do with song and dance and stories…We Murri fellas know that.’ Discuss this statement with students and prompt them to explore what Bertie means by this? Then ask: Why is oral language important to the Aboriginal culture? More about oral traditions can be found here. Next, as a class revisit some of the discussions you have had about the book. List the broad themes emerging from the discussions and the activities. One theme is likely to be the uniqueness of this text in relation to the story told and how that is done by the author Boori Monty Pryor and illustrator Jan Ormerod. Refer to the imprint page and tell the students that the book was first published 2010, and in 2011 it was the winner of the Prime Minister’s Award for Children’s Literature. Boori Monty Pryor is a stellar storyteller. I’ve seen him in action wowing young people and adults alike at schools, libraries, community events and major literary festivals. There’s no surprise at all that his most recent book Shake A Leg – with lively illustrations by the talented Jan Ormerod – was named the 2011 Winner (Children’s Fiction) in the prestigious Prime Minister’s Awards. Inspired by members of his own family, Boori – who hails from Northern Queensland and the Birrigubba and Kungganji nations – has cleverly woven his ancient traditions, culture and stories in a modern day yarn. Through the story of three young fellas hunting for pizza we get an insight into contemporary Aboriginal life. It’s a place where Blackfellas speak Italian (in fact, they go to Italy which takes the meaning of ‘going walkabout’ to a whole new level). Where Murris are chefs, nurses and sound engineers. Where crocodile pizza is washed down with milkshakes (now that’s what I call culinary fusion). Where the busy street acts as the bora ring today. And where people can live in cities and still respect and value thousands of years of culture. Provide copies of the review and in small groups ask students to read and discuss the review and clarify any words or phrases they are unsure of. Remind them of the purpose of a review (to persuade the reader to read the book) and that this was written when the book was released. Ask students to think about who the audience for that review might have been. Suggest now is the time to write a new review that will entice Year 4 readers today to seek out this text. Review the structure and layout of a review. Allow students to work in pairs or independently. If possible provide the opportunity for students to share their reviews with students of a similar age and get some feedback as to how persuasive the review is. Allow students to share their thoughts. Place students into small groups and provide each group with a copy of Shake A Leg‘s last page displaying the final paragraph and illustration. Once in small groups, invite students to discuss the picture and text in relation to what they feel the author is trying to tell the reader. Encourage students to justify/support their answers based on words/phrases/extracts from the text. Why do you think the illustrator chose to illustrate this paragraph with a star-filled sky? What do you imagine when you look at the boys in the picture beneath the stars? What do you think each boy is feeling? What messages do you think the author is trying to share with the reader in the last paragraph? List two things that you think the three boys learnt about Aboriginal culture from their experience with Bertie. Ask students to support answers with words/phrases from the text. Before beginning, draw students’ attention to reflective sentence starters to assist them in their responses. Provide students with the learning outcome and the self-assessment criteria (PDF, 290KB) prior to commencing the activity. After students are finished their personal reflections and have assessed their own work, the teacher can read over the rubric and provide their own comment. Depending on your class, you could use the rubric for peer assessment. Boori Monty Pryor was the Children’s Laureate 2012–2013 along with Alison Lester. While he was acting as Children’s Laureate, Boori toured Australia and the world. You can read all about his activities and adventures on Boori’s blog. Video to help them to understand the difference between similes and metaphors. Sydney Opera House hosts the Dance Rites Competition each November. What’s the Big Idea is from an article at scholastic.com ‘Finding the Message: Grasping Themes in Literature by Angela Bunyi. The Shape of Text to Come: How Image and Text Work Callow, J. (2013). Primary English Teaching Association (Australia) (PETAA). NAHDIA LEWENDON is a primary teacher who has spent the last 5 years working for Peel Language Development School. Prior to that she spent time working in Kalgoorlie as a mainstream teacher and 7 years as a School of the Air teacher. Quality children’s literature, especially picture books, is an essential aspect of her classroom teaching and learning program.